I love creating magic. If there is one thing that I have learned over the last few years, it is that the best ideas strike at the strangest times. 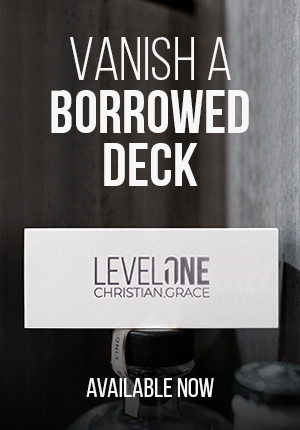 In the case of Level One, it was whilst helping to renovate an apartment. Surrounded by tools, paint and the smell of plaster, I was stood in my sister's apartment. Stood up against the wall was a group of floor tiles. Stood upright, I was amused to see that their matted clay edged, when stacked together, looked remarkably similar to the edge of a deck of cards. It gave me the seed of an idea. That evening, I spent countless hours creating a rudimentary version of the gimmick that would one day become Level One. Needless to say, no floor tiles are involved in the making of the gimmick which you will receive. I have played with all sorts of materials over the years and the version I settled upon is made from very durable plastic. It looks fantastic and will never break.